Just one month and a few days after the introduction of Samsung's 30 TB SSD, Nimbus Data pushes the size of the world's largest such drive to the impressive value of 100 TB. Compared to the previous owner of the crown, the new king of the storage market draws 85 percent less power per TB and has a 42 percent lower total cost of ownership per TB. The 100 TB model will be accompanied by a 50 TB one and both will be available this summer. 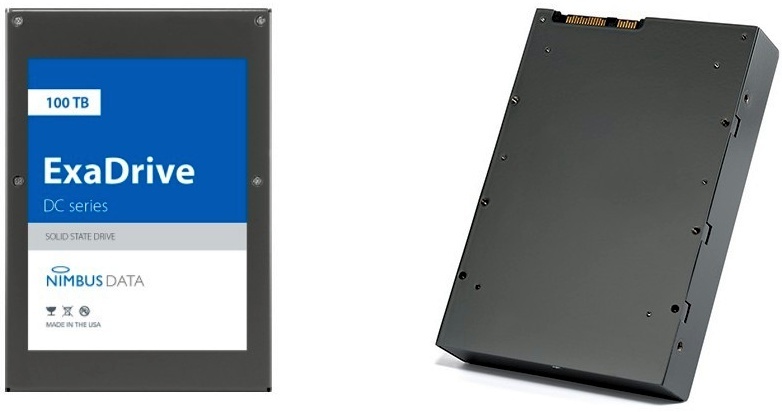 Last month, Samsung began the mass production of the PM1643 enterprise SSD. Back then, what made that drive special was its size: 30 TB, which made the PM1643 the world's largest SSD drive. Unfortunately for Samsung, this victory was very short-lived, since Nimbus Data has just unveiled the ExaDrive DC100, an enterprise SSD that provides no less than 100 TB of storage space. According to the official press release, the world's largest capacity SSD ever produced draws 85 percent less power per TB when compared to the Samsung PM1643. Even more, the total cost of ownership is 42 percent lower compared to other enterprise SSDs. Although it will come for a rather high price and mainly targets data center and edge applications, Nimbus Data also highlights that "the DC100 provides enough flash capacity to store 20 million songs, 20,000 HD movies, or 2,000 iPhones worth of data in a device small enough to fit in your back pocket." When used in the enterprise/data center sectors, a single rack of DC100 drives can provide more than 100 PB (100,000 TB) of raw capacity. However, the low power draw of just 0.1 watts per TB and its compact dimensions also make this drive ideal for edge and IoT applications. The list of technical specs includes up to 100,000 IOPS (read or write), 500 MBps data throughput, as well as an MTBF value of 2,500,000 hours. The ExaDrive DC series will hit the market this summer and will also include a 50 TB model next to the DC100. There is no information on the prices right now, but we will probably find out more in a few months.